Like all animals, bears exhibit specific adaptations that help them survive in their habitats. Black and grizzly bears are similar to each other in their biology, differing in a few key features such as claws, ears, face shape, shoulder hump and average size. Click here for information on how to identify a bear. In our region black bears are often black in colour but may be cinnamon-coloured (about 10% of our local black bears are this colour) These bears are colour phases of Ursus americanus, the American black bear. Black bears typically weigh between 70 and 150 kg but can get as large as 300 kg. Males are usually bigger than females. The grizzly bear is classified as Ursus arctos. Subspecies of grizzly bears have different names, depending on where they live – coastal, inland, and on which continent. Grizzly bears are named for their typical fur colour, which is brown with lighter or grizzled tips, however they can range in colour from very dark brown to blond. In areas of exceptionally abundant food, for example bears living on the coast that take advantage of salmon runs, grizzlies can weigh up to 450 kg. In our region they more typically weigh between 100 – 250 kg. Black bears tend to live in low elevation forested areas that provide abundant food and good den sites. Grizzlies often spend the summer months in high elevation forests and meadows. A common misconception is that bears don’t have good eyesight. The reality is that their sight is similar to that of humans and their hearing is a little better than ours. Bears use their exceptional noses to find food, locate mates, and detect and avoid danger. When searching for prey, bears primarily rely on their sense of smell and hearing. A combination of smell and sight are often used to locate nuts, berries, and other plant foods. Another common misconception is that bears are unable to run fast down hill. Actually, bears can reach 50 kilometers per hour in short bursts through very rough terrain, including downhill. Bears are classified in the order Carnivora, and they will eat meat if it is available. Bears’ molars are similar to those found in herbivores and reflect their predominantly vegetarian diet. About 20% of their food is from animals and insects with the remaining 80% coming from plants; thus they are omnivorous (i.e. eat almost anything). Bears’ digestive tracts lack the specialized organs found in true herbivores such as deer so much of the plant material they eat moves quickly through their digestive systems. Much of the plant fiber passes through undigested so fewer nutrients are extracted and of use to the bear. A black bear’s sharp, curved claws help them climb trees in times of danger and to reach nuts, seeds, and leaves. Grizzly bears have longer, straighter and stronger claws and large shoulder muscles (their “hump”), giving them a better ability to dig, but less ability to climb trees than black bears. Both species also use their strong claws to rip open logs and insect mounds and overturn rocks to scavenge for insects. Their front paws are dexterous, allowing them to open pine cones and nuts with considerable delicacy. Bears eat large quantities of food, especially during the fall before denning. They selectively forage for easily digestible foods with concentrated nutrients (e.g., fruits, berries, meat if they can find it). Bears can eat up to 20,000 calories per day (equivalent to about 40 Big Mac hamburgers) during the fall as they strive to store fat for the winter. Bears can increase their body weight by up to about 45 kg during a summer and use that stored fat to survive a denning period of 4 – 7 months. Bears are not true hibernators because their body temperature and vital systems only slow down a little and they are still relatively easily roused in the winter. Bears tend to enter their dens as the autumn abundance of food runs out at the beginning of winter; hence den-up dates are dependent on the area and the weather of a particular season. In Revelstoke, bears usually enter their dens around November and emerge around April. During denning bears neither eat, drink, urinate, nor defecate. Bears do not den because of the cold, but rather because there is so little food available in the winter. In some areas where food remains available all year round, males and non-breeding females do not enter dens at all. Bears reach sexual maturity at 3 – 4 years old and mate during early summer. Implantation of the fertilized eggs in the uterine wall does not occur until the female is ready to enter the den, usually in November. This phenomenon is called delayed implantation. If a female does not gain enough weight before denning, her body may spontaneously abort and re-absorb the eggs. 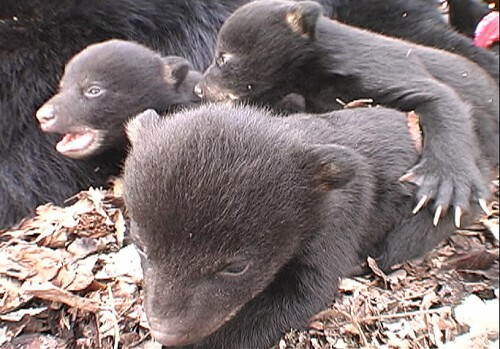 Black bears are usually born as twins or triplets. Cubs are born blind and almost furless in the den during January or February, and emerge from the den in April. Litter size is usually two or three, with two-cub litters being the most common. Older or heavier bears often produce more offspring. Black bear cubs remain with their mothers for about a year and a half; grizzlies for about two and a half years. During this time, they learn fundamental survival skills from their mothers. These early learning experiences shape a cub’s future behavior. Throughout life, bears also learn by trial and error, and by observing other bears. They have very good memories and rely on their memory to anticipate the location and/or ripening of food sources. Bears are usually solitary animals whose lifestyles are dictated by their biological need to consume large quantities of food. Bears only tolerate the presence of other bears during the breeding season, when a female is with her cubs, or when bears congregate in areas with concentrated food sources such as garbage dumps and salmon streams. Adult male bears are not part of the family unit. Within its home range, a bear may move from one habitat to another. These movements can vary by season and year, often in response to changes in food availability. In areas with little impact from human activity, bears are usually active during the day. A bear’s home range is not fixed, and may change over time as new resources develop and old ones disappear. Young females usually remain within or near their mothers’ home range, but young males must find territories to claim as their own. Dispersal is a difficult and dangerous time. Although bears have few natural predators, adult male bears can kill and eat youngsters. Since dominant males occupy the best habitats, younger male bears are often pushed into marginal habitats. Frequently, marginal habitats are close to human areas. As a result, young male bears have a higher risk of mortality. Bears may live up to 30 years but a more common life span is around 11 – 12 years.